was awarded the Japan Prize, one of the most prestigious prizes in science, in the category of Information and Communications. Established in 1985, the Japan Prize is awarded annually to esteemed scientists around the world for outstanding achievement in the field of science and technology that also aids in the advancement of peace and prosperity. 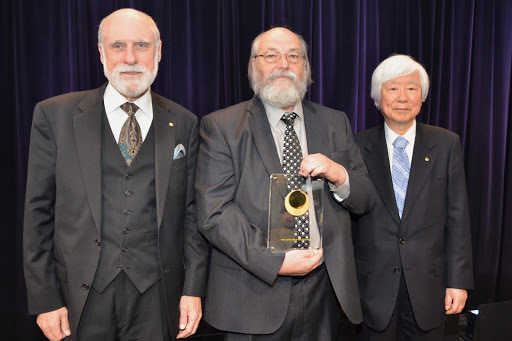 Ken shares the prize along with his former collaborator, Dennis Ritchie, for their development of the operating system UNIX. They both worked at Bell Labs in 1969, when they began developing an open source operating system that emphasized portability, small modules and superior design. UNIX served as a core infrastructure element in the information field, including the Internet, and operating systems carrying on the UNIX philosophy are now being used everywhere from mobile phones to supercomputers. As Foundation Chair Hiroyuki Yoshikawa noted, UNIX has been “a major driving force behind the development of the information age” with clear overarching benefits to society. Traditionally, the Japan Prize is awarded during a week-long celebration in Tokyo—even their Majesties, the Emperor and Empress of Japan, participate. Given the devastating earthquake and tsunami in Japan two months ago, the Foundation understandably concluded that the ceremonies should not be held this year. However, the Emperor insisted that the Foundation should travel to the U.S. to present the award to Ken and Dennis. At the May 17 ceremony at the Googleplex, Ken received his recognition in front of a packed room of appreciative Googlers. The Foundation also recognized our crisis response team for their Person Finder project among other contributions, which helped Japanese citizens trying to locate lost friends and family after the March devastation. In his acceptance remarks, Ken told one of the funniest stories I have ever heard about a pet alligator that he brought to Bell Labs and that later got loose. It is on the recording of the ceremonies—watch it here. Congratulations again to Ken and all the other Japan Prize winners and here’s to continued innovation in science and technology that fosters peace and prosperity around the world. This week, our own Distinguished Engineer Ken Thompson was awarded the Japan Prize, one of the most prestigious prizes in science, in the category of Information and Communications. Established in 1985, the Japan Prize is awarded annually to esteemed scientists around the world for outstanding achievement in the field of science and technology that also aids in the advancement of peace and prosperity.